In our last episode, we discussed how to identify how far in the purchase funnel your prospects are simply by looking at their search query. 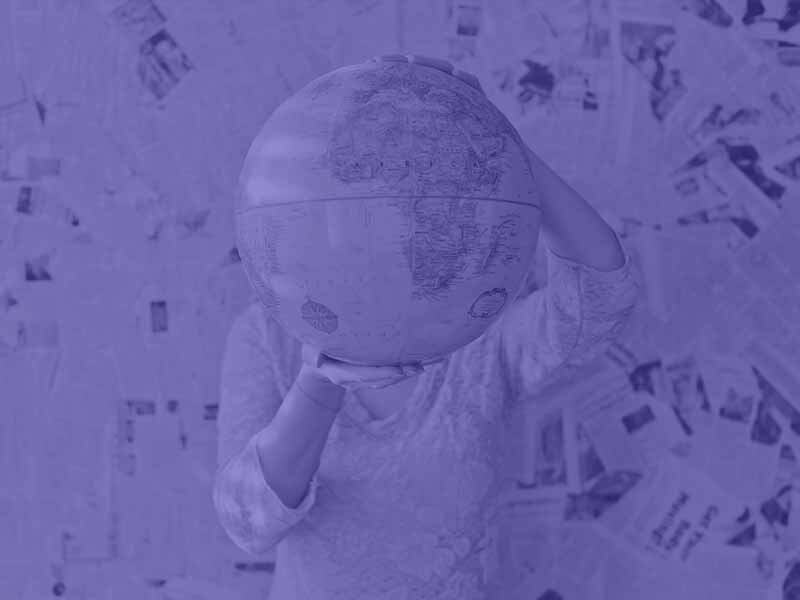 In today’s Part 2 episode, we will be taking a close look at the fragile balance between cost-efficiency and volume in Search Engine Marketing. I am sure you’ve all heard about the Pareto principle, otherwise known as the 80:20 rule. Surprisingly, this rule applies to pretty much anything you can think of, including search engine marketing! This is all approximate, of course, but 20% of your keywords will bring around 80% of your traffic. Similarly, 20% of your keywords will cost you around 80% of your budget, or 20% of your keywords will bring approximately 80% of your sales or conversions. Therefore it is important to understand what the 80% and the 20% are. The 20% of keywords are called the Head terms. These are keywords with high search volume, but which are also more competitive – and therefore pricier. But they are also less relevant in nature, meaning your conversion rate will be lower, and therefore your cost-per-conversion will be higher. An example head term would be “mens shoes”. 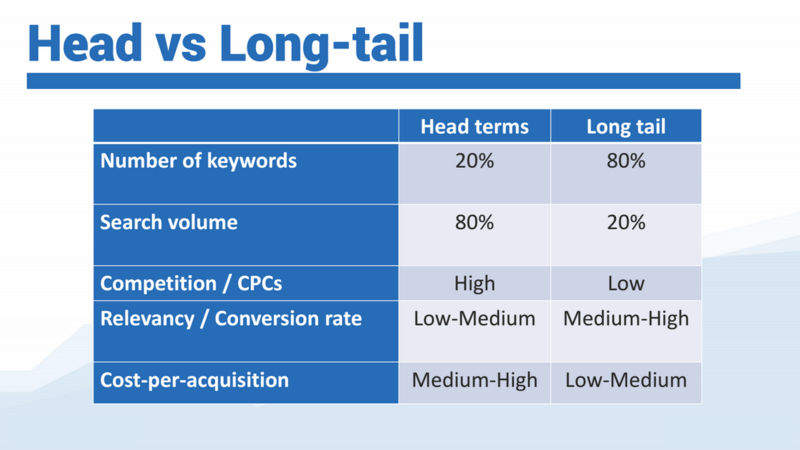 On the very opposite side of the scale are your long-tail keywords, which are very specific in nature. They are less searched, but also much less competitive and therefore more affordable. Their specific nature also means a higher relevancy and therefore conversion rate, resulting in lower cost-per-acquisition. 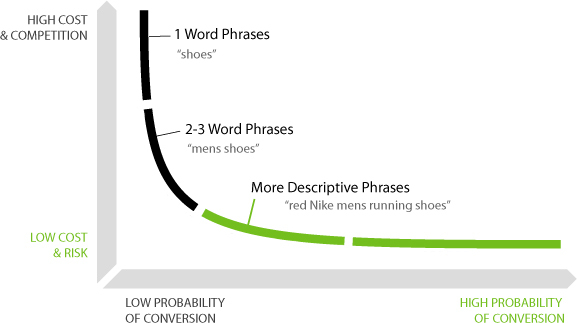 An example long tail keyword would be “mens black leather shoes”. Here’s a more visual explanation, courtesy of Neil Patel. There are two approaches in getting your account right. Both have pros and cons. The first one is to start large and refine your campaigns over time as you start collecting performance data. The second method is to start with a very focus, or targeted approach and then expand over time. If you are going after the first method using head terms, your campaigns will generate many clicks, but you are at risk of spending your budget very quickly whilst not generating the volume of conversions you expect. You will struggle to bring your cost-per-acquisition down until further optimisations have been made. >If you have a large budget and time, then perhaps this approach is the most appropriate as you will gather many insights on what works or doesn’t work, very quickly. The second approach is to start small, with only a few highly-targeted keywords, ensuring a very good cost-per-acquisition is achieved. However with this method, you are likely to struggle to spend your budget. You will need to expand your keyword based in search for more searched keywords. But doing so will make make your cost-per-acquisition increase over time. >This approach is more appropriate for those on restricted budgets, who may want to run an Adwords campaign as proof of concept, rather than a large sales channel. 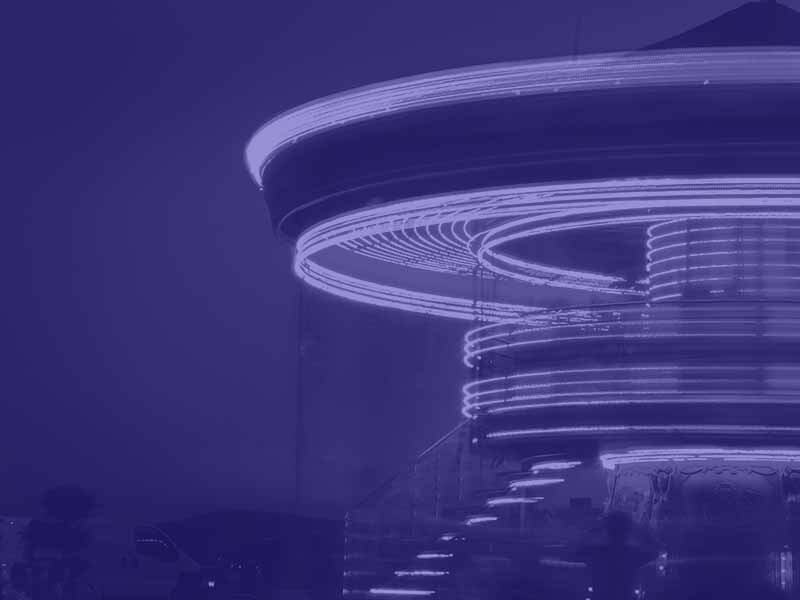 Finding the right balance can be tricky, and we recommend you think carefully about your approach before creating your campaigns. Remember, every Adwords account is different and needs to have its own tailored approach. So good luck finding your perfect balance! Again, thank you for watching today’s episode. Hope you found this information useful. If you have any question, do not hesitate to add a comment below and we’ll make sure to reply as quickly as possible. Also, if you enjoy our videos, feel free to subscribe to our YouTube channel as well as our blog where we release new articles on a regular basis. And of course, we’re also present on good’old Facebook, Linkedin, Twitter, etc.